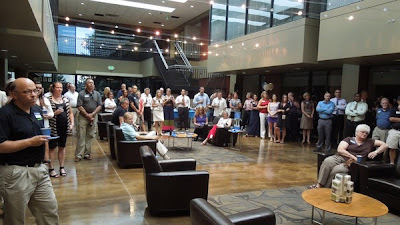 The Denver campus hosted a networking event on July 9 to introduce itself to the business community and welcome friends and neighbors to campus. About 125 members of the South Metro Denver Chamber of Commerce, including President John Brackney, attended "Business After Hours," which was held in the main atrium of the Denver campus building. Many staff and faculty members also attended. Assistant Director Allison Friederichs spoke about Columbia College's mission, accreditation, degree programs and students. Two instructors, Chris McGee and Mike Jenkins, talked about how much they enjoy teaching at the campus. Chamber members have already given feedback to the Denver campus about what a great impression the faculty and staff made and how dynamic the higher education team is.